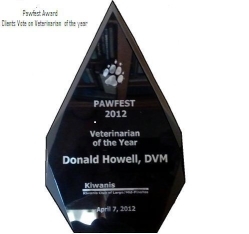 posted: April 17, 2012 by: MAH Tags: "Clinic Specials" "News"
Dr. Howell was honored as Vet of the Year at Pawfest 2012 / 2014. The Kiwanis Club of Largo Mid-Pinellas asked residents to select a veterinary that went "beyond the call" of duty. It was the first year Kiwanis had the award. Click here to view Award Information for Dr. Howell!